A lot of times people may forget that there is a small, close-knit community that sits between Bowen and Slade. But as you travel south on Highway 15/11 you cannot ignore the signs directing you to the Nada Tunnel. 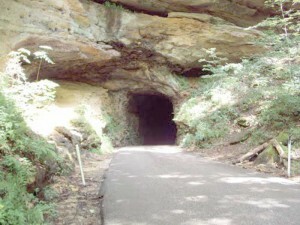 It is the gateway into the Red River Gorge and the area is rich with history. But without Nada, what would the tunnel be called? The history and heritage of the area will be highlighted this weekend at the first ever Nada Mountain Heritage Festival. The festival will begin at noon on Friday and run thorough 4 p.m. on Sunday. Organizers hope to make it an annual event. Nada is particularly known for the tunnel. The tunnel was basically hand-carved and measures 13 foot by 12 foot. It is 900 foot long. The construction began in 1910 and was completed in 1911 as hand tools, dynamite and some steam drills were used so that timber could be hauled out of the area on a train. But this weekend Nada hopes to be known for more than just the tunnel. They want to be known as a place with mountain heritage, everyday people and for their role in the history of the Gorge. The festival will open at noon on Friday. It will start up again Saturday and run from 10 a.m. to 10 p.m., then wind down on Sunday from 12:30 to 4 p.m. Local radio stations will be on hand and Settle just hopes every one will attend. “It is the first one and we want people to enjoy the fun,” she said. You can take Exit 33 at Slade then head north on Highway 15/11 until you come to Nada Tunnel Road (Highway 77). But for a more scenic route, take Exit 22 in Stanton and turn right on College Avenue. Stay on Highway 15/11 for miles of beauty and splendor until you come to Nada. Then you can see why a Mountain Heritage Festival is in order for a place that is one of the county’s best kept secrets.